In real estate the mantra is location, location, location! I actually believe this can be a factor in the success of a garden, too. I have visited gardens on busy roads where the noise and pollution has dulled the experience. On the other hand, I have visited gardens in an idyllic setting, and this has enhanced the enjoyment, indeed thrill of the visit. 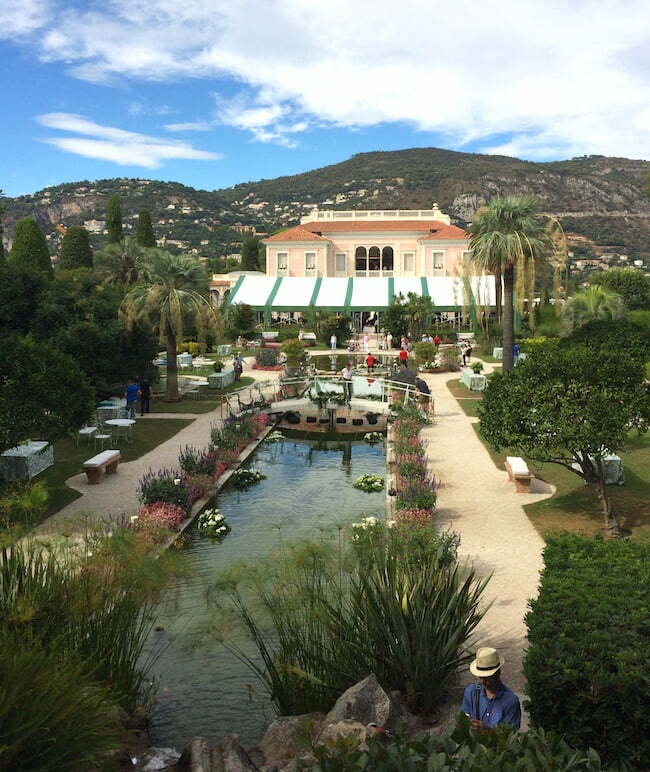 A garden in the second category is the one at Villa Ephrussi de Rothschild at Saint-Jean-Cap-Ferrat, near Nice, on the Côte d’Azur of France. 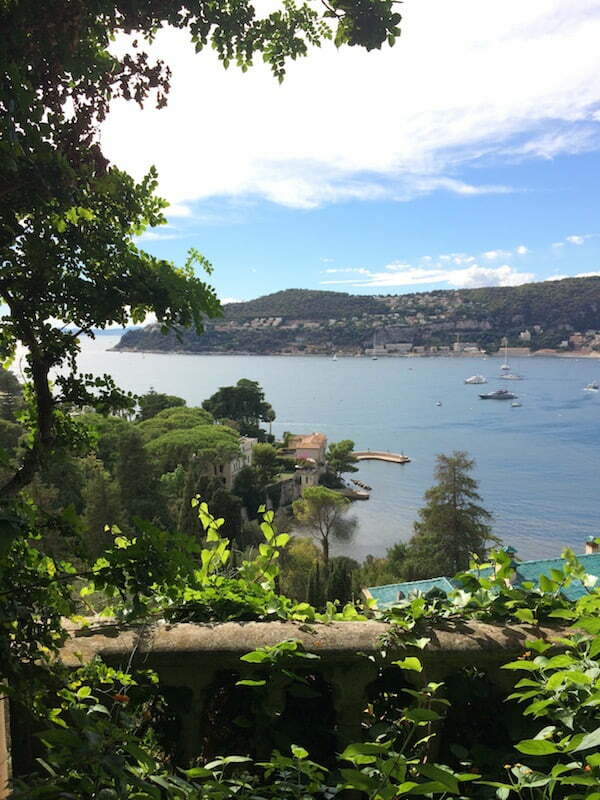 As one drives toward the villa the road winds up almost to heaven, and as one looks down the Mediterranean shimmers below. Here position certainly heightens the experience! The actual entrance to the villa is modest, but after one has ascended even higher, one reaches the shop and entrance and the beauty of the garden begins to reveal itself. We visited on a Saturday, and the whole garden was abuzz with florists. It would become obvious that the wedding of wealthy Italian families was to take place, so the garden had to be suitably dressed. 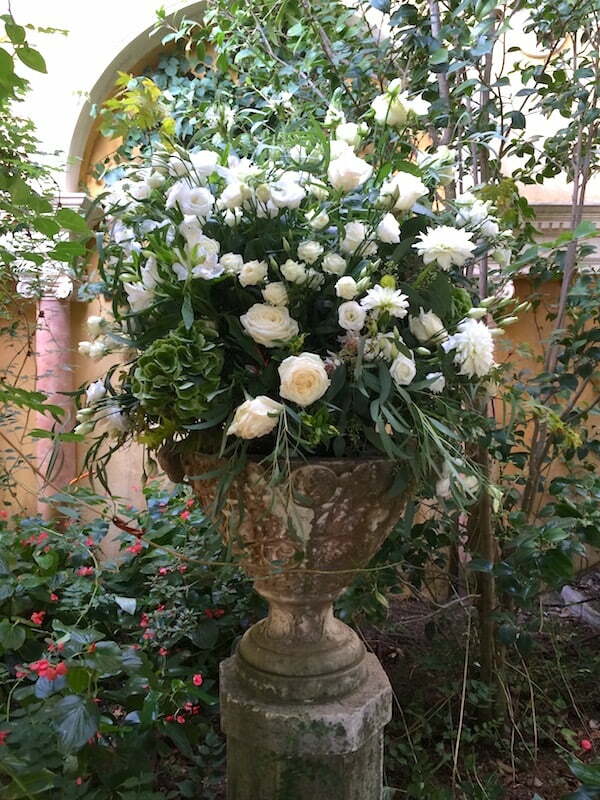 In the courtyard in front of the grand rose-coloured Venetian palace that the villa is, there were massive arrangements of white flowers in decorative urns. 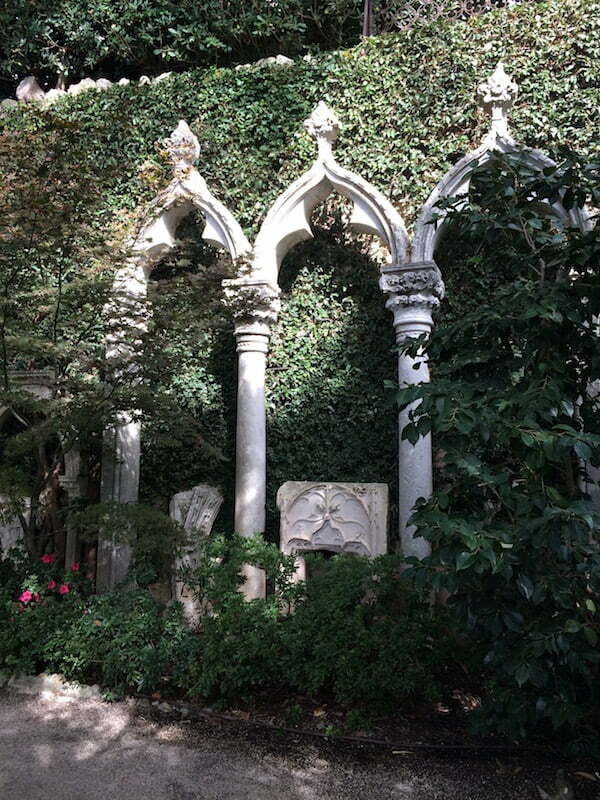 Even the columns in this area, and beyond, were festooned with a cornucopia of white flowers and myriad lush green leaves. Included in the 15 Euro admission fee is the entrance to the house, which we skirted around, as the garden was what we had come to see. 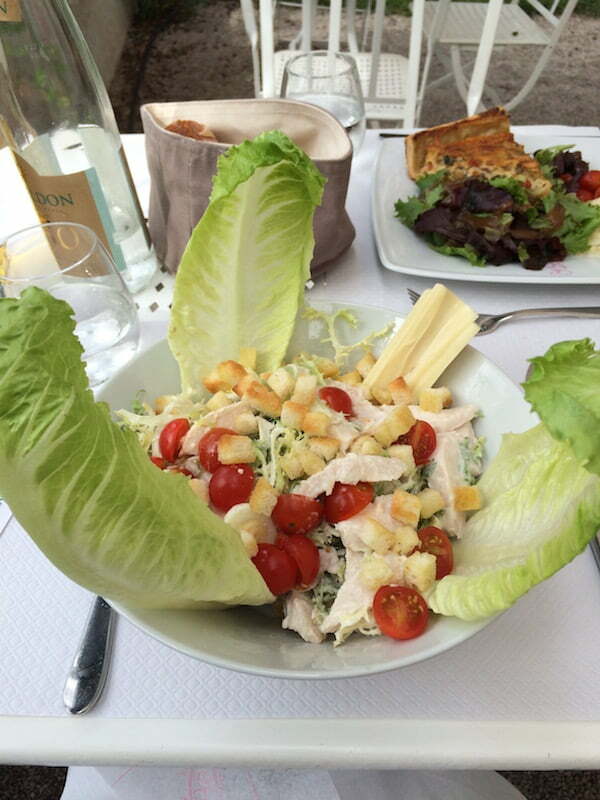 We did find time to sit in the garden café for a simple lunch. 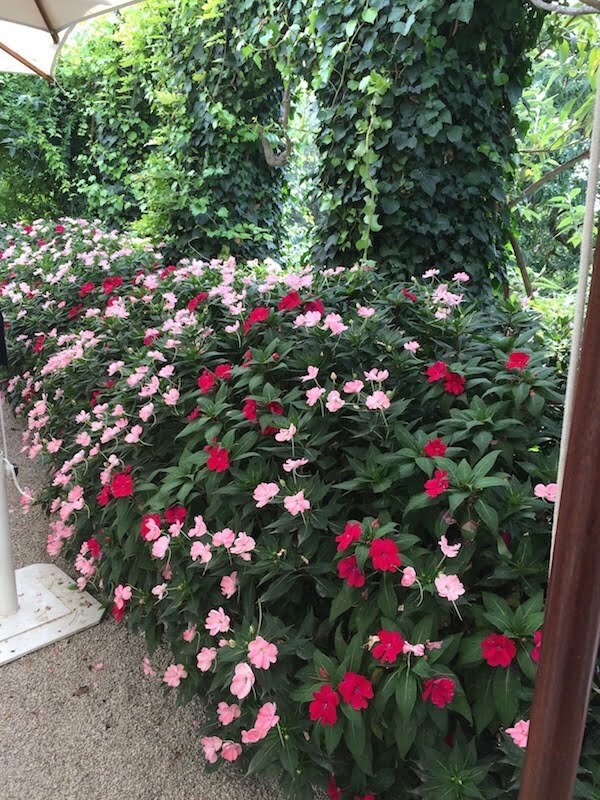 Here, we were surrounded by a border of pink and red impatiens, and ivy-covered walls punctuated with arched windows. 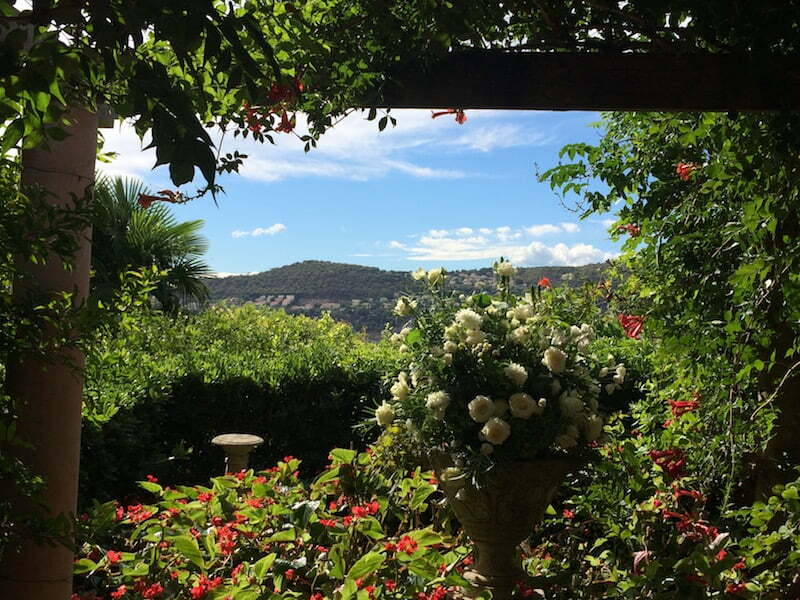 The view toward the sea, especially on this sunny day, was breathtaking, particularly framed by the ancient olive trees! After lunch we started to wander down the path, which leads to all the different garden rooms. As you walk along, the impending wedding was already having an impact on what we saw. Wherever there was a climber on a wall or fence, hundreds of roses, white, green, and softest shell pink, had been threaded into the leaves, with each bloom in oasis foam to keep them fresh. 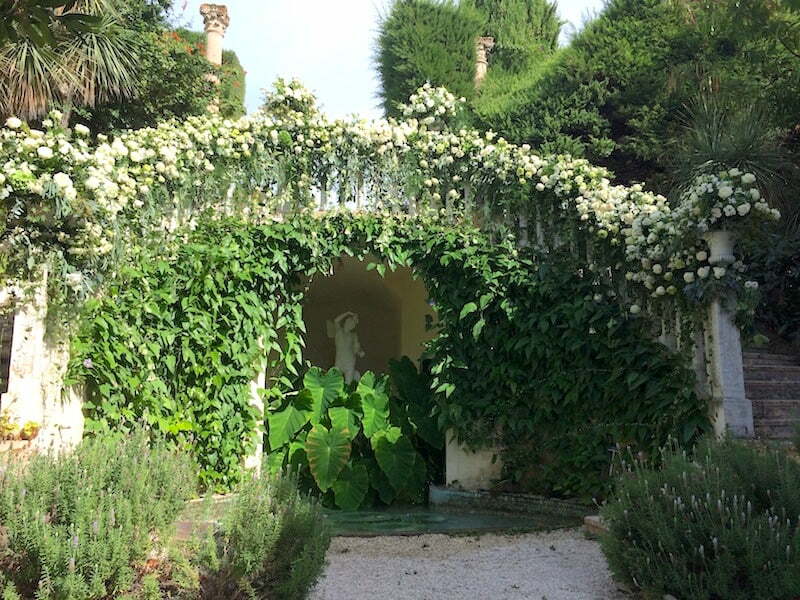 One of the first garden elements we passed was a grand staircase, in the Sèvre garden, that was adorned with acres of glossy leaves, more roses, but also white carnations, lisianthus and other blooms. The affect of the flowers was almost like snow on the railing, it was so dense! Feathery asparagus fern also got quite a work out. 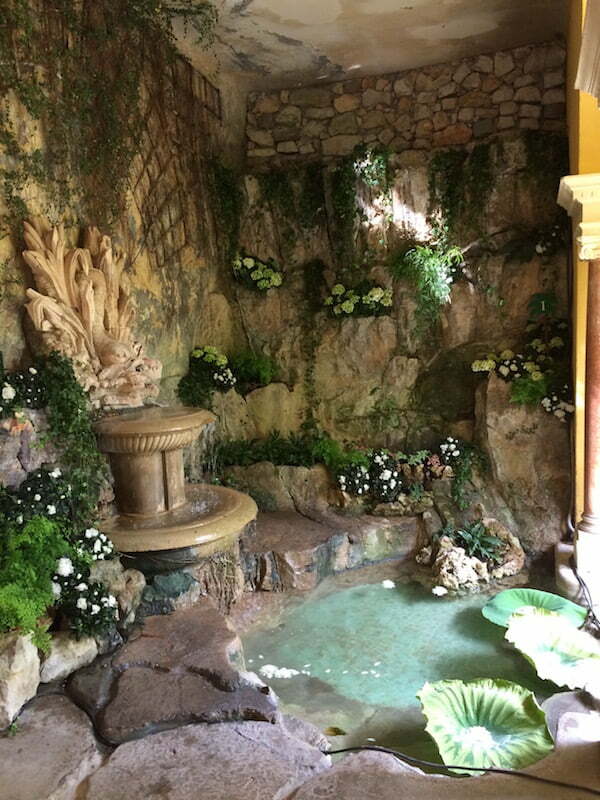 Just below the staircase, there was a grotto with a small baroque fountain. Here again the florists had been embellishing the space. 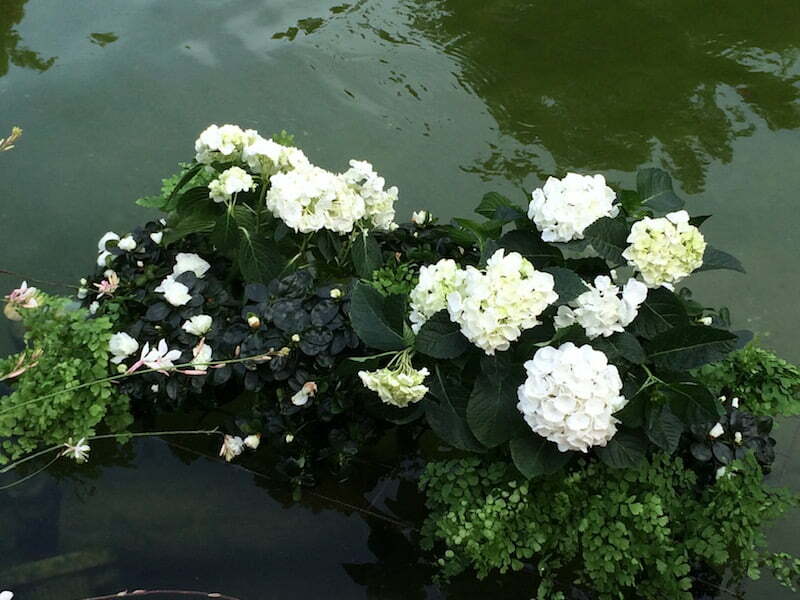 The large water lily pads hosted white dahlia flowers, and every nook and cranny of the grotto was planted with hydrangeas with green and white flowers. Although it was easy to work out what had been added to the garden, it was sometimes hard to know how much it affected our response to it. 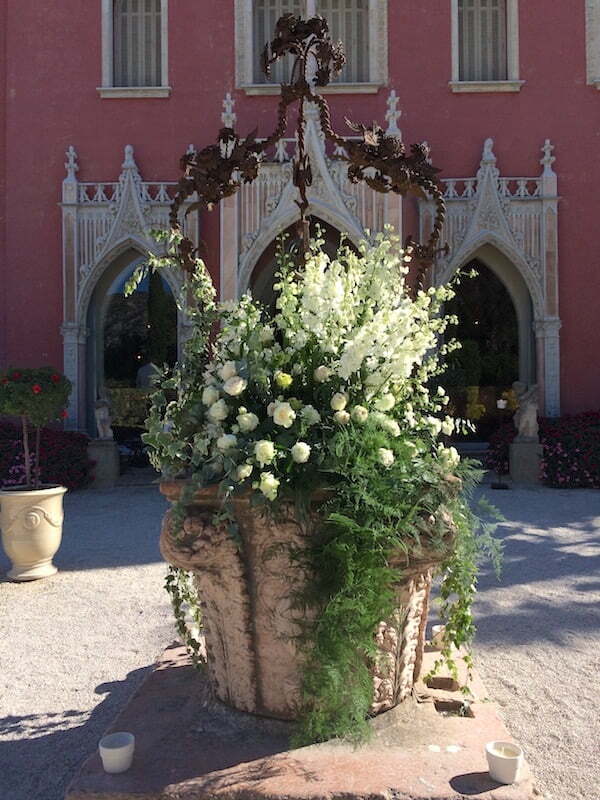 For example, the large heavily carved marble pots throughout the garden were partially hidden by the floral displays that filled them. I wondered whether they were normally empty or were filled with potted plants? Flower arrangements added for wedding – are they usually empty? Beyond the Sèvre garden there is the Spanish Garden, fairly formal, but in the shadow, both literally and figuratively, of the French garden above it. However, it does have attractive columns framing it. The French garden is the main event behind the house, and the focus of its view. It was also where the Italian wedding was to take place, so this area was the most heavily laden with any white flower available. Sadly the addition was not necessarily attractive. It was as though the florists felt the more they threw at the space the better it would look – not true. It is worth noting that Baronesse Béatrice de Rothschild, the woman is responsible for the construction of the house and garden, designed the French garden to be like the deck of the Isle de France ocean liner, especially as when it was viewed you can see water on both sides like a ship. 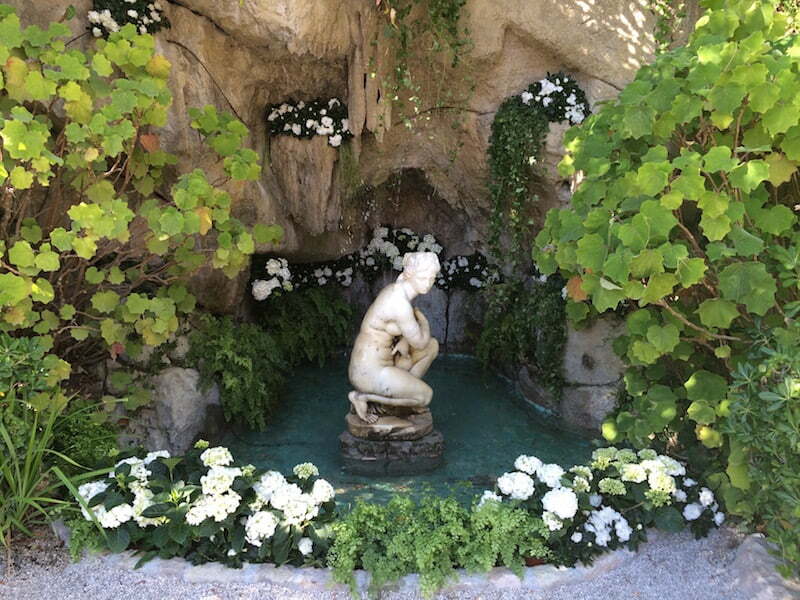 Even the main canal in the French Garden was awash with floating flower arrangements, and the famous articulated fountains were turned off while the florists paddled around in the water. 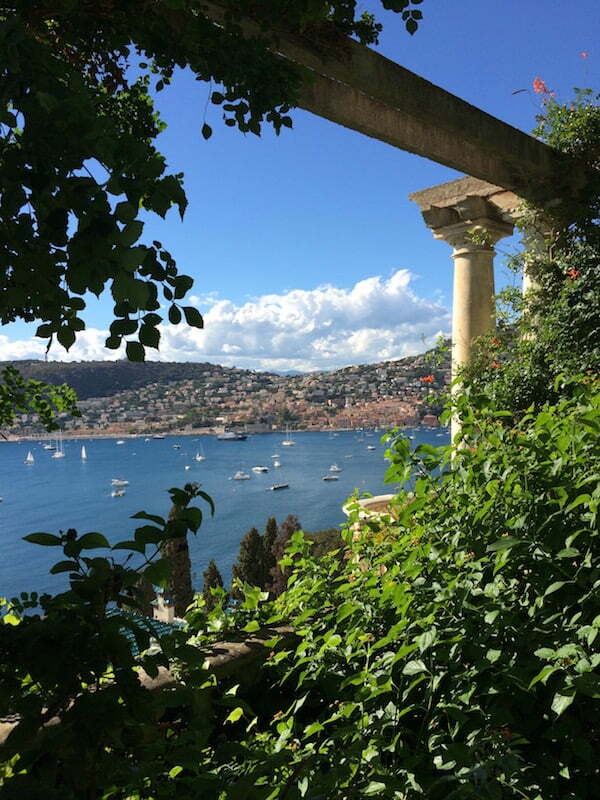 At the end of the French garden, what Béatrice called the bow of the ship, there is a gentle stepped rise up to the bronze-domed Temple of Love, with a lovely classical statue in its centre. There is even a gentle flow of water down to the main canal from the temple, framed by groundcover pink begonia. The sound of water a lovely addition to what one could see. 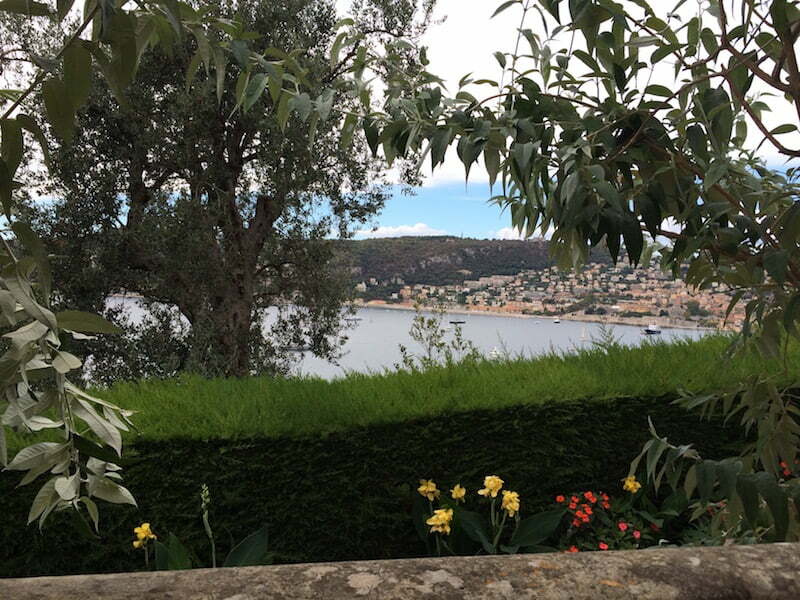 Beyond the French Garden, on the left hand side, clinging to the side of the hill is the Provencal Garden, with lavender, rosemary and agapanthus as understory for old olive and cypress trees. 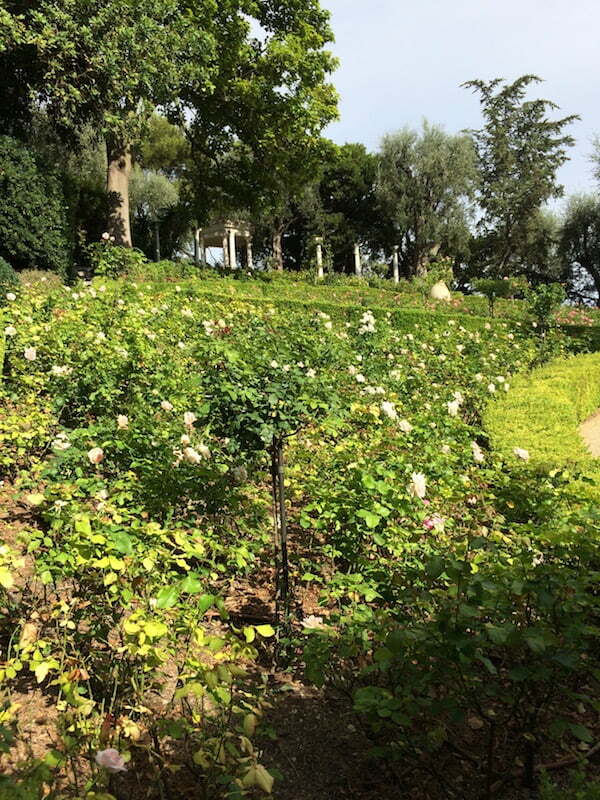 As the garden turns around to the right, at the farthest point from the house, the Rose Garden fills the hillside. At its highest point a simple gazebo gives the area a focus, and a place to sit and contemplate the roses and the sea beyond. Further around, there is the Exotic Garden, full of the expected succulents, cacti, cycads, palms, ginger, and bamboo, but there is even a handsome Australian flame tree growing proudly in the mix. Wandering back toward the house from the Exotic Garden we came across the Japanese and Stone Gardens. The Japanese Garden was created by a Japanese designer, Professor Shigeo Fukahara, and is predictably full of plants such as azaleas, rhododendrons and camellias. Predictable perhaps, but nonetheless beautifully arranged, amid traditional Japanese garden ornaments. The walls of the nearby Stone Garden are covered with dwarf creeping fig. This acts as a backdrop for the fragments of buildings such as arches and columns that are the main feature of this area. This garden was a delight to visit. It was well cared for and plants were all in excellent health. We were lucky with the weather perhaps, sunny but still, but this garden would be a delight at most times of year. As we wandered down the drive I was reminded of one of the tests of whether a garden worked – would you want to own it. Without doubt, I would enjoy the challenge and beauty of this garden, and I admire the woman who created it. You should have wandered through the house as well because the design and curation of the interior complement the magnificence of the garden – but perhaps it was closed for the impending wedding. 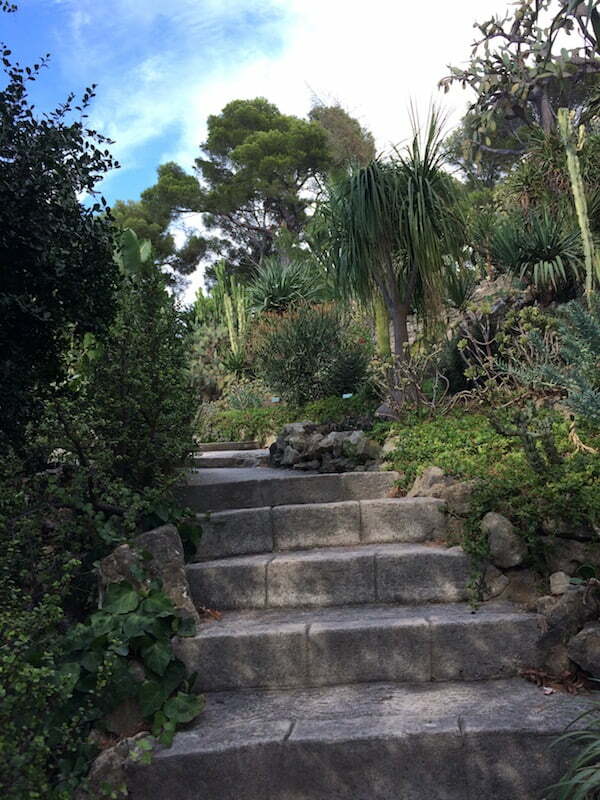 But aren’t the gardens a delight – been there a couple of times and one of my favourite garden destinations. When the fountains are operating to classical music it is enchanting. How the other half lives/lived! Loved reading your post about this beautiful garden. Quite true about the setting making all the difference. Given that piece of land (in our dreams), what kind of garden would each of us choose to make? Thank you for sharing your visit to such a beautiful garden. I particularly liked the relatively simple range of plants used en masse. 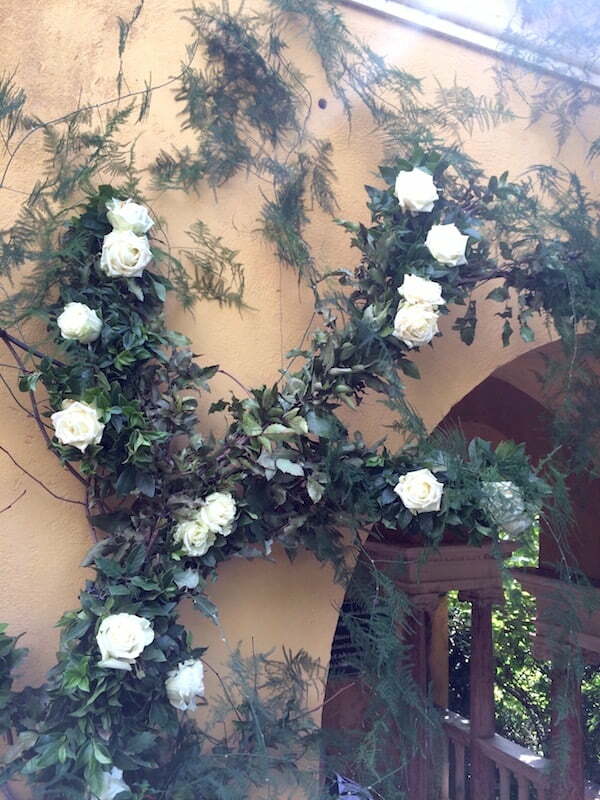 Being a former flower arranged, I would have loved being involved with helping to decorate for the wedding. I would normally say that you can never have enough flowers , but I agree with you that their use was a little excessive and detracted from the natural beauty of the garden. I would also have wandered around the house! Dear Natalie, we did pass through the house, and it certainly was extraordinary, but my focus was the garden. The wedding flowers were very much overkill, as though the more that were used the better the affect would be! I hope to visit the grden again some day without the wedding dress! I am sure it will be quite different! I am embarassed not to have made it clear it was Edward (Ohanessian) who took ALL the photos used in the article (on his Iphone), not me! 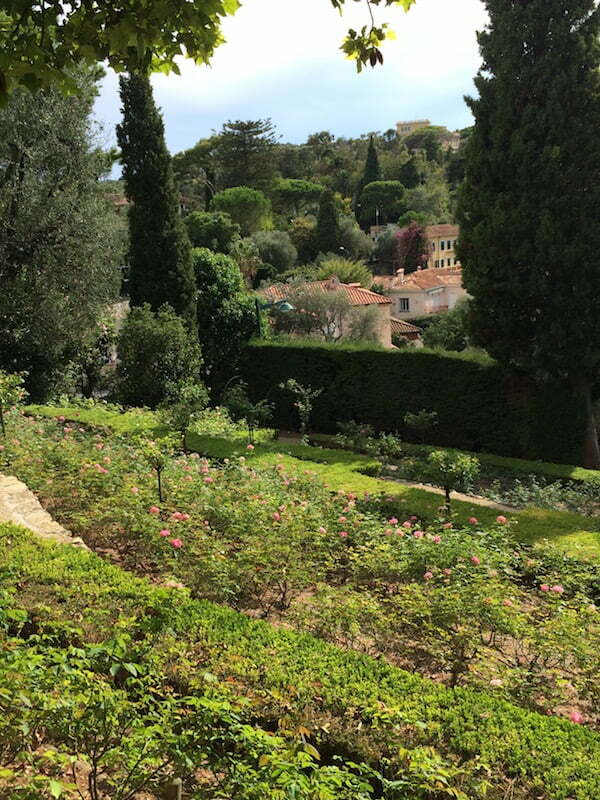 It looks like an enormous and well cared for garden, or gardens. You describe it so well. I would love to visit it one day. It is a special garden, Ines! I hope you have a chance to enjoy it. It is one of those places that transports you to somewhere magical. The pictures are stunning which makes me think that it is even more magical to see first hand. I imagine one could see there for hours just soaking up the scenery and atmosphere. Another must see destination to add to my ever growing list. Would be interesting to see the garden sans wedding set up for comparison. Hi Natasha, Thank you for having a look. It is an extraordinary book. You should know that Edward took all the photos, and on his iPhone! He was cited as the photographer, as I forgot to let the editor know! I hope life is going well of you. 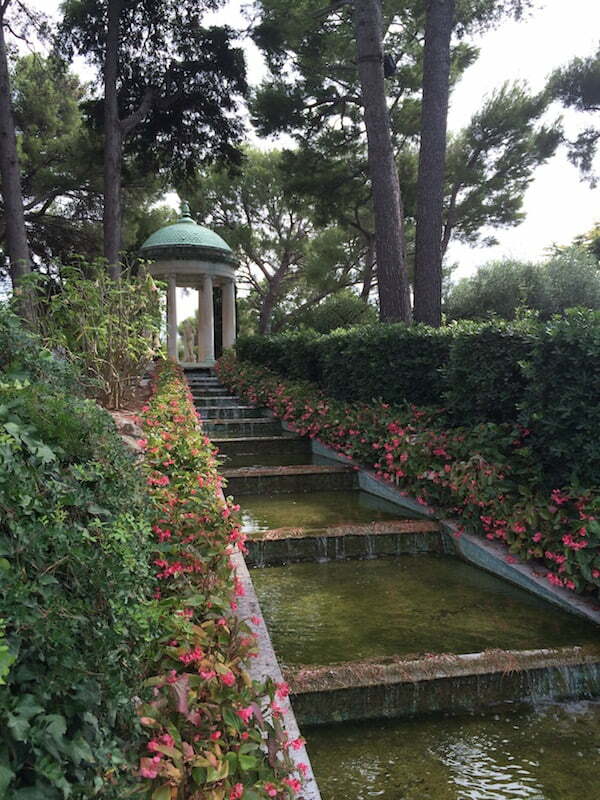 It felt like this garden should have been in Italy for mine. Spectacular example of this design genre. Not my cup of tea I have to say, but it hits a certain pinnacle of gardening endeavor and I can certainly see how its spectacular (if ostentatious) displays and the borrowed views that makes it worth a visit. Thanks for reminding me of a pleasant afternoon there in the past. Thanks Stu. You can stalk if you like, but I am also pleased that our garden is enjoyed by others. One of the concepts in garden design I love most is “borrowed landscape”. Without fences, our garden is your garden! Thanks Bernard for writing about this amazing garden and house. Poor Beatrice had a sad life in so many ways, I hope she gained much pleasure out of creating this beautiful place. And, most importantly, because she donated the property to the Academie des Beaux Arts, it wasn’t gutted by the Nazis and we are able to enjoy it today. A most interesting presentation Bernard, and congrats to Edward the photographer. I visited last year and loved it (without the extras) both inside and out. Thanks, Doreen. We gave a cursory visit to the house. We were robbed of an hour (early closing) because of the Italian wedding! 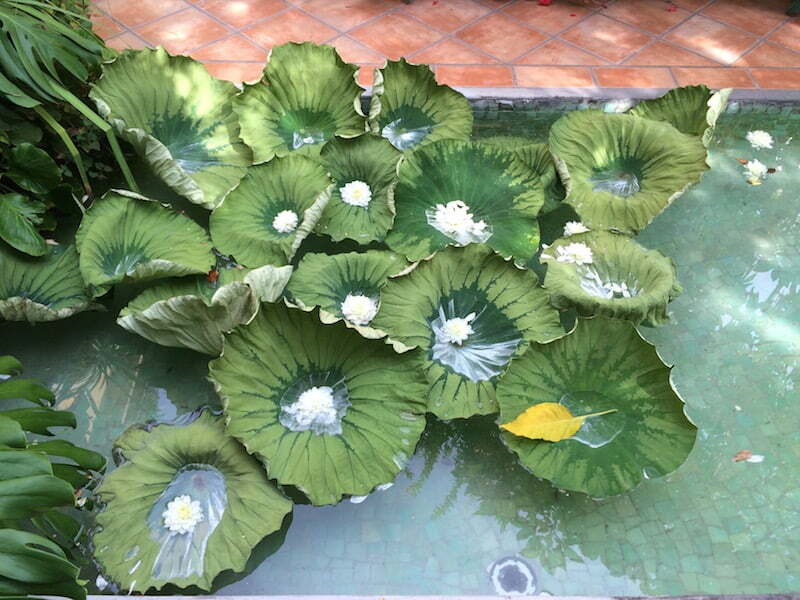 Really enjoyed your article bernard and i agree the wedding flowers were overkill, especially the flowers on every lily pad! Again, fabulous photos from edward, what can’t that man do? Sweetie! Thanks for the kind words about the article. Yes Edward takes perfect photos. He is a man of great sensitivity and talent. Don’t ask him to sing though! Regarding the garden, I hope, one day, to see it without all the added flowers! My dear Bernie, thank you so much for sharing another very poetic experience. I loved it. You should write a book collecting all the refined details from your trips, like this one with the lovely, sensational photographs taken by dear Eddy-O. You two make perfect partners in art as in life. Love to you both….. Stunning garden; equally stunning and interesting review. Thank you Bernard. Thanks, Neale. Edward took the photos, and on his iPhone. Everything came together for the day, including the weather (maybe a tad hot! ), so it would have been hard not to have been impressed and enthralled by this palace and its garden. My God, Bernard, this place looks insane! I wish I knew about it when I was living down the road in Montpellier… it looks infinitely nicer than the crappy old courtyard garden my place had. I especially love that tiered water feature. How fortunate you were there on the day of a wedding. Thanks for the article and spreading the word. Thanks, Matt. Wow, you certainly have been a lot of places! In Montpelier we stayed in a lovely gite. Beauty not shared has its place in the world, of course, but when it is shared with others the result is much greater, maybe even boundless, pleasure. Fabulous article Bernard, many thanks. Such a gorgeous garden, definitely on my list of places to go. I also would have loved to see it “au naturel” but the wedding flowers are gorgeous too. 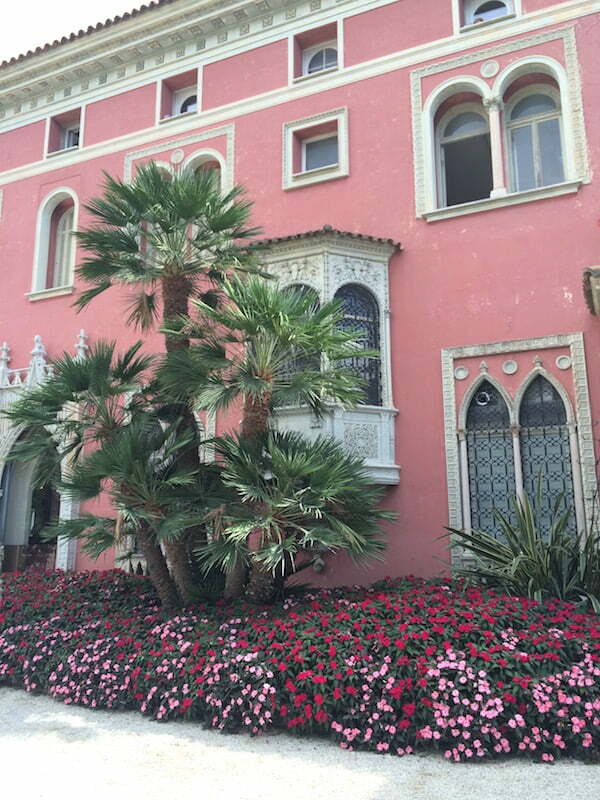 The Ephrussi family (who Beatrice married into) feature in the book The Hare with the Amber Eyes. I have started reading it a few times, and always get side-tracked into something else. I’m now inspired to get back into that too. As always, Edward takes wonderful photos! Wonderful article! You are certainly right when you talk about location, location, locstion! Stunning vistas! The Baroness certainly has left a wonderful legacy. Thanks, Mon, it was fun to write the article but more fun visiting the garden! Thank you so much Bernard (and Edward) for a very evocative description of this beautiful garden. You made me want to go and see it and the wonderful photos added so much. I agree that you should compile your garden visit stories into a book. A good reason to go and do more research! Thank you for the pleasure you both give us. Sweet of you to peruse, Margot. I know what a keen gardener you are! It is an interesting idea compiling a book. Unfortunately, I fear it has been done before and probably better than I could do! I am sure no one would take better photos than Edward, though!